Pithos 1.3.0 was released recently and is now available in its official PPA, for Ubuntu 17.04, 16.10 and 16.04. The new version brings support for MPRIS playlist and tracklist interfaces, improved accessibility UI, and more. 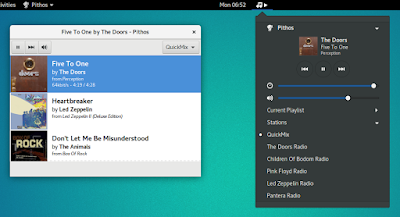 Pithos is a Pandora Radio (only available in Australia, New Zealand and the United States) client that supports Pandora features such as love / ban / tired, allows creating, editing and switching between stations, and more. 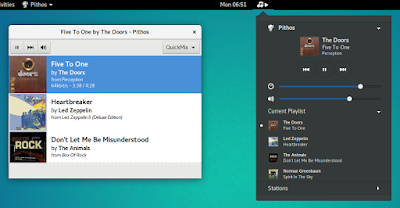 The application integrates tightly with the desktop, providing notifications, MPRIS v2 support (it integrates with the Ubuntu Sound Menu / GNOME Shell, etc. ), media keys, can inhibit the screensaver and so on. Pithos 1.3.0 includes a complete MPRIS implementation thanks to the addition of playlist and tracklist MPRIS interfaces. 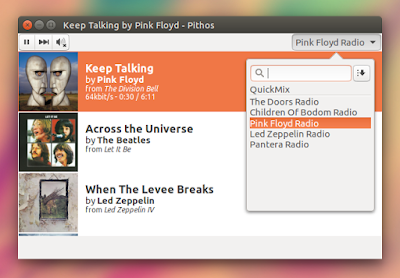 This feature does not work with the Ubuntu Sound Menu due to an upstream bug. Another change in Pithos 1.3.0 is the addition of a new plugin that allows controlling the systemd logging level (or completely disabling it) for Pithos. The logs since last reboot can be printed by running Pithos with the "--last-logs" command line argument. fixed handling error on MPRIS plugin failure. Also, compared to the Pithos version available in the official Ubuntu / Linux Mint repositories (1.1.2 for Ubuntu 17.04 and 1.1.1 for Ubuntu 16.04 / Linux Mint 18), the application has received quite a few improvements, including a keyboard shortcuts window, more quality options, the password is now stored with libsecret, along with bug fixes. The UI was also updated to use header bars and the stations dropdown now uses a popover. Pithos currently has only 2 contributors and it could use more devs. If you can help, see its GitHub page. For installing Pithos in other Linux distributions (including Flatpak), see the install section on its homepage. Report any bugs you may want @ GitHub.